(Nanowerk News) In life, we sort soiled laundry from clean; ripe fruit from rotten. Two Johns Hopkins engineers say they have found an easy way to use gravity or simple forces to similarly sort microscopic particles and bits of biological matter -- including circulating tumor cells. In the May 25 online issue of Physical Review Letters ("Stochastic and Deterministic Vector Chromatography of Suspended Particles in One-Dimensional Periodic Potentials"), German Drazer, an assistant professor of chemical and biomolecular engineering, and his doctoral student, Jorge A. Bernate, reported that they have developed a lab-on-chip platform, also known as a microfluidic device, that can sort particles, cells or other tiny matter by physical means such as gravity. By moving a liquid over a series of micron-scale high diagonal ramps -- similar to speed bumps on a road -- the device causes microscopic material to separate into discrete categories, based on weight, size or other factors, the team reported. The process described in the journal article could be used to produce a medical diagnostic tool, the Whiting School of Engineering researchers say. "The ultimate goal is to develop a simple device that can be used in routine checkups by health care providers," said doctoral student Bernate, who is lead author on the paper. "It could be used to detect the handful of circulating tumor cells that have managed to survive among billions of normal blood cells. This could save millions of lives." Ideally, these cancer cells in the bloodstream could be detected and targeted for treatment before they've had a chance to metastasize, or spread cancer elsewhere. Detection at early stages of cancer is critical for successful treatment. How does this sorting process occur? Bernate explained that inside the microfluidic device, particles and cells suspended in liquid flow along a "highway" that has speed-bump-like obstacles positioned diagonally, instead of perpendicular to the path. The speed bumps differ in height, depending on the application. "As different particles are driven over these diagonal speed bumps, heavier ones have a harder time getting over than the lighter ones," the doctoral student said. 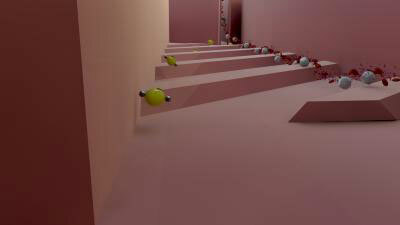 When the particles cannot get over the ramp, they begin to change course and travel diagonally along the length of the obstacle. As the process continues, particles end up fanning out in different directions. "After the particles cross this section of the 'highway,'" Bernate said, "they end up in different 'lanes' and can take different 'exits,' which allows for their continuous separation." Gravity is not the only way to slow down and sort particles as they attempt to traverse the speed bumps. "Particles with an electrical charge or that are magnetic may also find it hard to go up over the obstacles in the presence of an electric or magnetic field," Bernate said. For example, cancer cells could be "weighted down" with magnetic beads and then sorted in a device with a magnetic field. He is slated to complete his doctoral studies this summer, but until then, Bernate will continue to collaborate with researchers in the lab of Konstantinos Konstantopoulos, professor and chair of the Department of Chemical and Biomolecular Engineering, and with colleagues at InterUniversity Microelectronics Center, IMEC, in Belgium. In 2011, Bernate spent 10 weeks at IMEC in a program hosted by Johns Hopkins' Institute for NanoBioTechnology and funded by the National Science Foundation.